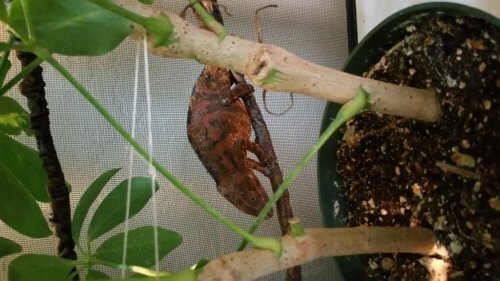 Possibly pregnant or just paranoid, new female owner? 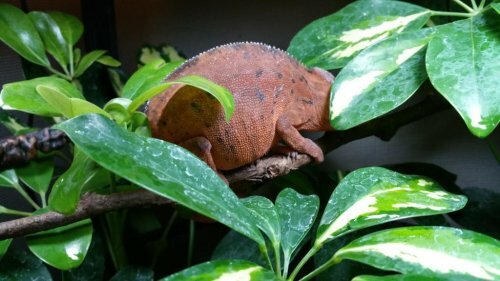 Your Chameleon - Female Panther Chameleon. We were told she was close to 2 years old when we got her from LLL Reptile at a Reptile Show about 3 weeks ago. Handling - 1 or 2 times a week to weigh her and look her over. Supplements - Calcium every day, D3 every other Sunday, and Multi-Vitamins every other Sunday. Watering - Mist at least 3 times a day and i have physically seen her drink. 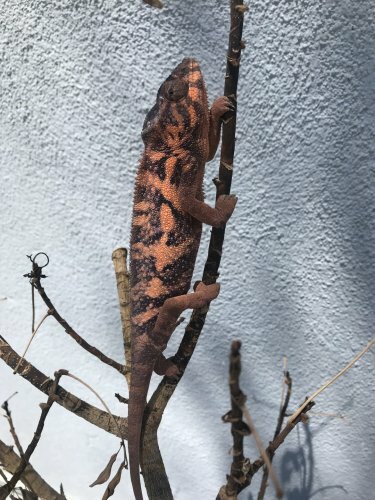 We purchased our female panther about 3 weeks ago at a reptile show. Up until the last couple days she has looked very bloated and just kinda sits on her branches looking lazy. She eats and drinks fine but just looks tired. She never sleeps during the day and does move around. I thought she may be ready to lay eggs from either being pregnant (Since she was housed with a male at the reptile show and was very dark and seemed pissed) or just possibly laying infertile eggs so i made a laying bin and put it inside her cage. The last time i weighed her she was at 60.5grams (about a week ago but has since become bigger around her belly) and felt around her belly but didn't feel any eggs or anything solid. Her poop and urates look normal and she eats well. She looks very peach/orange when resting but gets black/darker when she moves around. Any clarification on what could be going on? 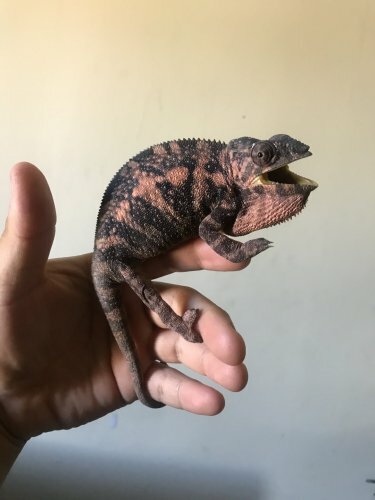 Ive never owned a female but have a couple other males so i have some knowledge about what I'm doing with chams. 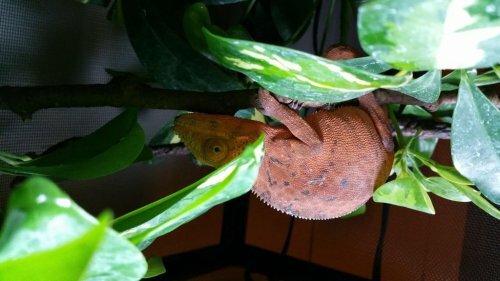 Everything seems fine , she does look like she may have eggs in her, does she normally crawl to the bottom also does she turn dark with a peach stripe in the center of her body? , females are know to be lea active they mainly chill in one spot , also does she look similar to the pics I posted? the post says its from 2015 so hopefully shes had it figured out!! She is most likely gravid and needs privacy and a lay bin! I thought there was a expectation date on old threads and you couldn’t post on them after a certain period of time. Is that not true?